Yep, you can deploy your own software packages using LDMS MDM, not just those software applications available on the App Store. 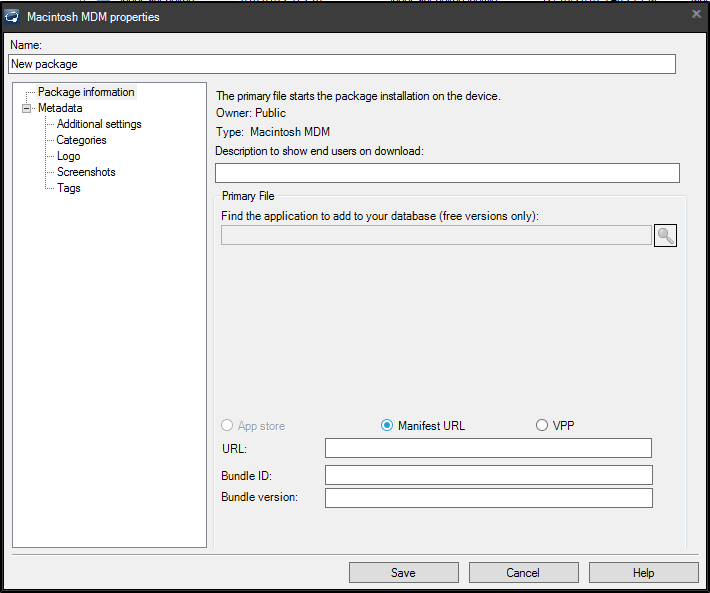 Create an installer package (a .pkg file) created with the productbuild command-line tool, and signed with the root certificate of your mdm solution. A webshare, accessible from your intranet or the Internet. You can place the package and manifest file in a hidden directory or in any location that’s readable using https. It must be readable using https, and using a non-self-signed certificate, since Apple URL services will not connect via https to a server with a self-signed cert. Once you have these three things, you can fill out the Manifest URL UI to create an LDMS package to distribute to enrolled macOS devices using MDM. You will need to replace identity-name with the name of a valid signing certificate on your computer. If you have enrolled your macOS device in the LDMS MDM service, you can find the certificate for the MDM service in your system keychain. This is a valid signing certificate for deployment with our MDM solution. 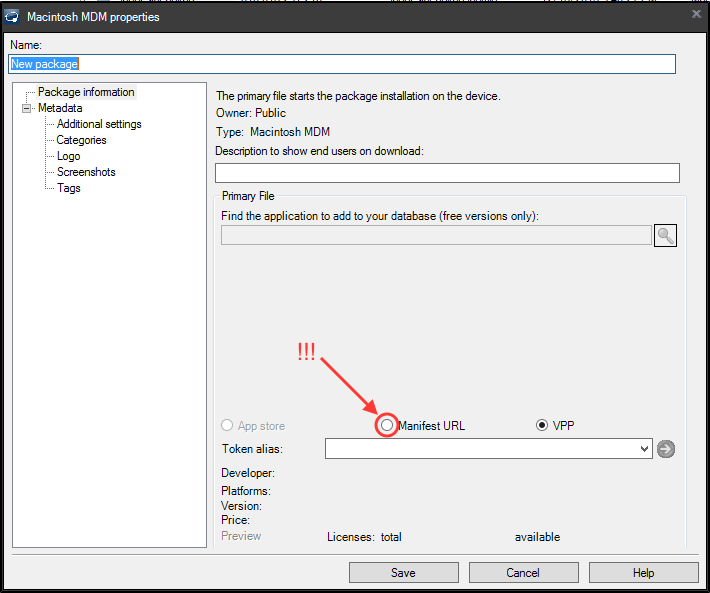 The location of the the installer package on the https server. Replace “https://www.example.com/apps/myapp.pkg” with the actual name and location of the hosted package. The md5-hash of each 1 megabyte chunk of the installer package file. Replace the array of md5 hash (labeled “md5s” above) with the actual hashes. The bundle identifier and version of the application you are installing. Replace the strings labeled “bundle-identifier” and “bundle-version” above with those strings. The size in bytes of the application package. Replace the string labeled “sizeInBytes” above with this. When the manifest file (“something.plist”) has been successfully created, it needs to be moved to the same server that is actually serving the installer package. Best practice is probably to place both the manifest plist file and the installer package file in a directory appropriately named on the https server. So, for example, if our application was named “Example.app”, we might have Example.pkg and manifest.plist files sitting on the server in a directory named “Example”. Once we have the package and manifest file build correctly and hosted on our https server of choice, filling out the LDMS Manifest Package UI is pretty simple. I paste the manifest file url into a web browser, load it up, and copy and paste the bundle id and version into the LDMS Manifest Package UI, along with the manifest file url. Manifester will create a .manifestation folder which you then upload to the location on your https webshare that you specified in the Manifester UI. Manifester currently supports creating manifest distribution for macOS applications. We will be enhancing it as we get time to support other file types (probably fonts will be first). It should be available through the LANDESK Community site soon after the first of the year. Here are the slides used in today’s webinar; including the embedded videos. LANDESK Management and Security Suite 2016.3 has MDM management built into its core functionality. Once a device is enrolled, you’ll have access to apply a number of different “Agent Settings” commonly known as Configuration Profiles in the Apple world. LDMS 2016.3 has 4 out-of-the-box editable agent settings that can be built and assigned to a Mac or iOS device; Mobile Compliance, Mobile Connectivity, Mobile Exchange/Office 365 and Mobile Security. You’ll find all of these profile in the Agent Settings tool within the Configuration toolbar of the Management Suite console. Mobile Compliance can be used to ensure the device’s integrity. For example, you can enable a compliance rule to detect if the device has been jailbroken and if it has, choose to selectively wipe it removing access to everything you’ve deployed to the device. Mobile Connectivity is where you would upload certificates to be used to bind to WiFi as well as the appropriate settings for the device to access your corporate WiFi. Mobile Exchange/Office 365 should be self-explanatory. Within this setting you’ll configure how your MDM devices will be configured to access your corporate email. Mobile Security has the real meat and potatoes for the agent settings. You can set a password policy, restrict the device functionality such as access to FaceTime, block access to the iTunes store, set the accessible ranges for content and ratings, control the behavior of iCloud and even block TouchID from unlocking the device. Mix and match the agent settings as desired, when deploying them out you do not need to employ a “one-size-fits-all approach.” When you create your Agent Settings task, you can select one of each to deploy at, giving you a ton of available combinations of configurations. Once you have all of your Agent Settings created as desired, just create a Change Agent Settings task and target your MDM devices. While still in the Agent Settings window, click on the Calendar/Clock icon, it’s the second one in the menu bar and then select Change Settings. Find the “Mobile …” from the list on the right hand side of the panel and click on the corresponding Keep agent’s current settings window area. Find your newly created Mobile Agent Setting and select it. Now set your desired Task Settings (policy, push, policy supported push) and desired portal settings (required, recommended, optional). I used a policy-supported push and required. Once a device is added to a task and the task is started, every time the device “syncs” with the LANDESK Management Suite server, it will compare itself against the current scheduled tasks on the core with what it currently has applied and will add/remove profiles accordingly. So don’t delete your task once you’ve successfully applied an agent setting, so doing would in effect tell LANDESK to remove the agent setting from the device the next time it syncs. With the release of LANDESK Management Suite 2016.3, LANDESK can now manage a Mac using an MDM profile in addition to the traditional LANDESK agent. One of the main benefits of enrolling with the Mac the MDM service, in addition to already having your regular agent installed, is that you’ll be able to push a VPP app to the Mac. 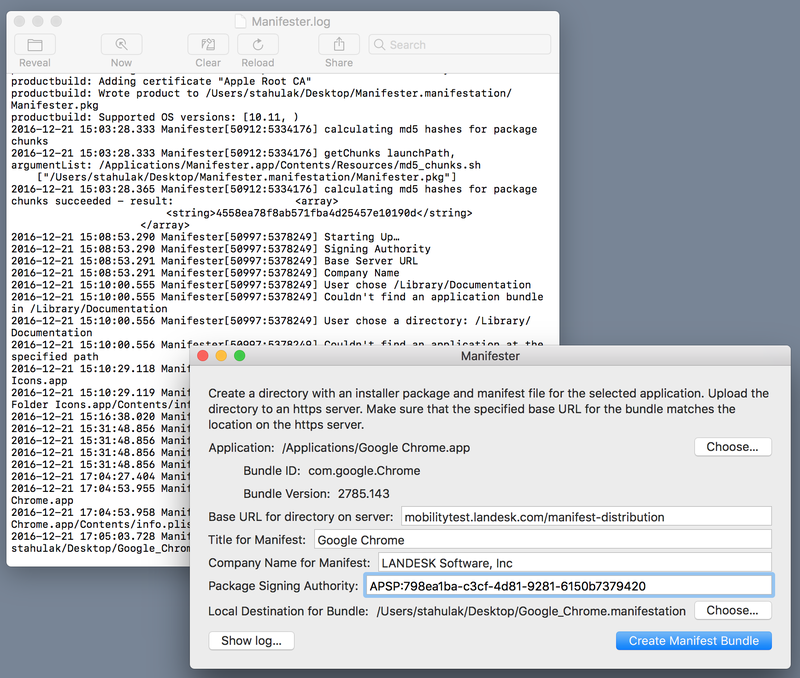 This blog will walk you through the process of creating a package to install the LANDESK MDM Enroller app on your Mac and then subsequently running a script to enroll the Mac with the MDM service. The script is pretty basic, you just need to call the command line utility with a -u for username, -p for password and -m for the enrollment server. The script has been built with variables, so just adjust the variables and you’ll be set. Note: The script is calling the command line utility built inside of the LANDESK MDM Enroller application. That means that in order for this script to properly execute, the LANDESK MDM Enroller must already be installed. To ensure this takes place, we are bundling the packages together and will tell LANDESK which package to execute first. #  Created by Bennett Norton on 11/1/16. #change the variables to match with a valid LANDESK Management Suite user, corresponding password and enrollment server URL. The server URL format should be the fully qualified name of the Cloud Service Appliance / LANDESK Server name. /Applications/LANDESK\ MDM\ Enroller.app/Contents/MacOS/ldmdmenroll -u "$landeskUserAccount" -p "$landeskPassword" -m "$enrollmentServerURL"